Having said that presenting a vegetarian main dish here. 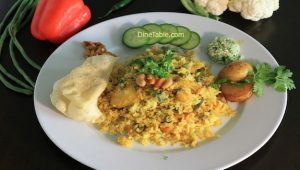 Its an easy vegetable dum biriyani. 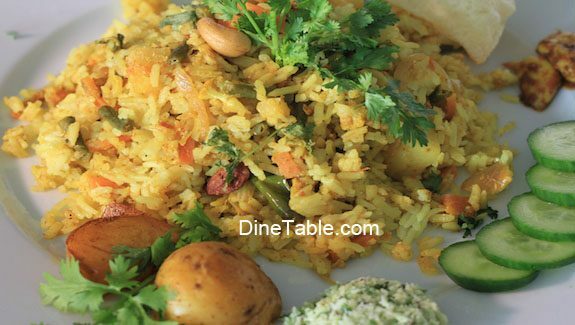 Just note that its actually difficult to make tasty vegetable biriyani than a non-veg biriyani. So follow each and every step carefully. Please do not skip the “dum step”. It adds the actual flavour for your biriyani. While serving, garnish with masala potatoes which I have mentioned in the last part of method. 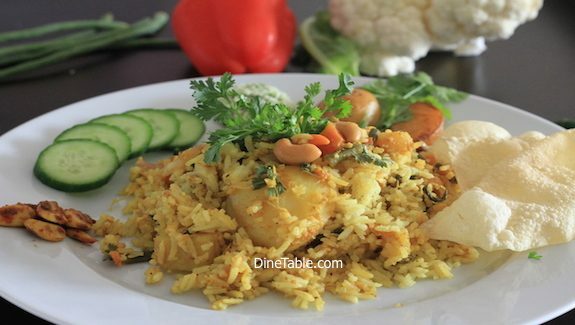 Click here for other tasty Biryani Recipes. Firstly prepare biriyani rice. For preparing rice, boil water in a pot. In a separate think bottomed pot, heat coconut oil and saute rice for 2 minutes on medium flame. Then add garam masala, garlic cloves and turmeric powder to rice and mix well. Then add boiling water, mix well and adjust Salt. Cook this on lowest flame and allow rice to cook. In parallel make masala. For that heat oil and saute onion, ginger paste, garlic paste, green chilli, long beans, carrot, cauliflower and add adequate salt. Once vegetables are half cooked add mint leaves, coriander leaves, turmeric powder and garam masala. Mix well. Then add tomato juice, yoghurt & lime juice. Mix well and allow to cook for 3 minutes. Then adjust salt. Increase flame and evaporate excess water, if any. Then switch off flame. The masala is ready. Next is the most important and last step. It is to do dum for biriyani. 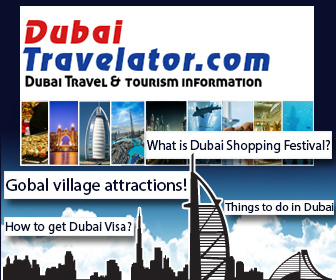 There is a traditional process of steaming over coal called as doing “dum”. I am doing this process in a clay pot and in my gas cooking range oven. 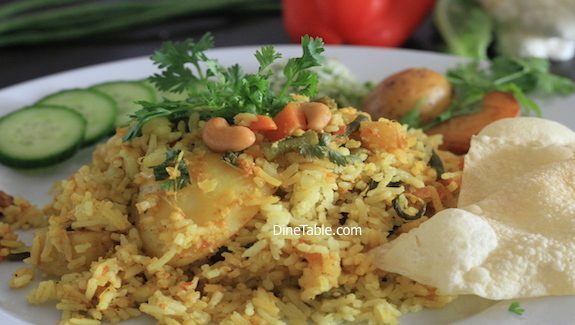 This really adds taste and flavour to Biriyani. Grease a dry clay pot with ghee. Layer biriyani rice and vegetable masala by adding some fresh mint leaves and some ghee in between the layers. On top, add a spoon of ghee. Close the clay pot tightly with an aluminium foil. Bake in gas oven at 170 degree for 20 minutes. 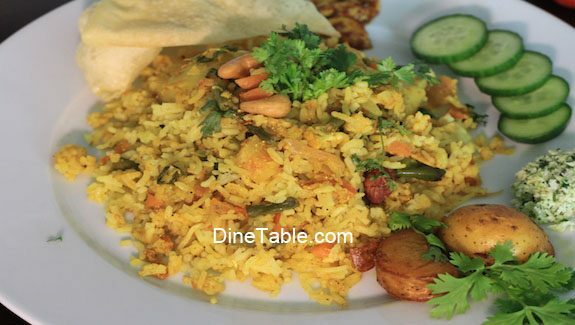 After 20 minutes your easy and tasty vegetable dum biriyani (ബിരിയാണി) is ready to serve. For seasoning while serving, shallow fry boiled potato cubes in coconut oil, chilli powder, turmeric powder and salt mixture.